Having a quick and easy to teach/learn game is a must. Because sometimes the only time left to play a game are the 15 minutes before the take-away arrives or the pasta finish cooking, or there are some waiting time for the last member of the party to arrive. That is pretty much what happened last Saturday and we cracked open Tornado Ellie. By all accounts a kid’s game. One that was launched at Spiel 2015 and had a ton of people (mostly kids) stacking cards on top of meeples at the booth. And it looked fun and pretty hard too! 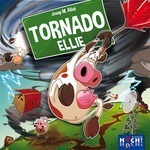 In Tornado Ellie, the players are farmers in the middle of a tornado who must sacrifice animals in order to keep the tornado at bay and not have their farms, crops and cattle blown away. The game components are pretty interesting. A grooved board sits atop four strips of cardboard that assemble to form a platform. On top of that grooved board goes another board, which is the tornado itself. Held in place by a small cylinder, the players will guide the tornado from player to player for the game to progress. Each player also has a hand of four double sided cards, three barn shaped meeples, three cow meeples and three cylinders to represent trees. During their rounds, the players use the cards in their hands to place them on the tornado platform. The mechanic is to place a number of animals on the platform. The cards have either pigs, hens, sheep or cows in different numbers. Players have to find a card that either has the same number or greater of the combination of animals on the board, or a card with just one type of animal but in numbers greater than the animals present. For example, if there is a card with three cows on the tornado, the player has to put either a card with only cows on top, or a card with a combination of animals as long as there are at least four cows on it. Considering there are a large combination of cards, to follow the rules is easier said than done. Also there are some special cards with single animals that either change the order of play or make it slightly harder for the next player. When the player can’t place cards on the platform, things get a bit hectic. That means that the tornado gods are not happy with the sacrifice – or lack of – and then the tornado will take away some things away from the farmer. The back of the cards has drawings of either trees, barns or cows and that is what the player has to sacrifice to the tornado gods off their starting stash. How do you do that? Piling up the meeples on top of cards. That “simple”. Once the tree, cow or barn meeples have been put on top of each other to form a tower, the tornado has to be sent to the next player and hopefully not topple it. If it falls (which is very likely) then the player who wasn’t nimble enough looses all their assets. But that is a good thing for the other players who, thanks to the grace of insurance companies, will get one of the toppled resources back. Because that is what insurance companies do… pay some people on the back of the disgrace of others. Eventually the game ends. Not sure how or when, though, because we were a bit bored after a while and had to go. This game has too many flaws to be in my list of good games, to be honest. For starters the rules don’t make clear little things, like what happens if the player topples the tower before they rotate it and thus before the player sacrifices any of their resources. Then there is the theme, which, quite frankly, makes no sense. You really get away from having your cows, trees or barns destroyed by putting other animals in the line of the tornado? And then when another player suffers, you are rewarded? Seriously? The artwork is great, I have to say. The animal caricatures are lovely and the whole set up is very nice to behold. Also the wooden tokens are of a good enough size and quality too. However that is pretty much where the quality ends. Adding cards to the pile brings little joy other than “oh great… I put a card here!” and that’s it. There is little reward there. Stacking the tokens on top of cards also becomes a bit of a fruitless endeavour, specially if the player is feeling evil and puts the cows or the barns on their base instead of on their side. It becomes almost impossible to stack them at any height, which I found very frustrating. This game will probably do well with children. The whimsical graphics and the silly nature of building up the stack of tokens just to watch them fall will make kids chuckle. It is very easy to teach and learn too. If you are looking for a game for younger players this might be worth considering, but if you want a dexterity game, there area much better choices out there.